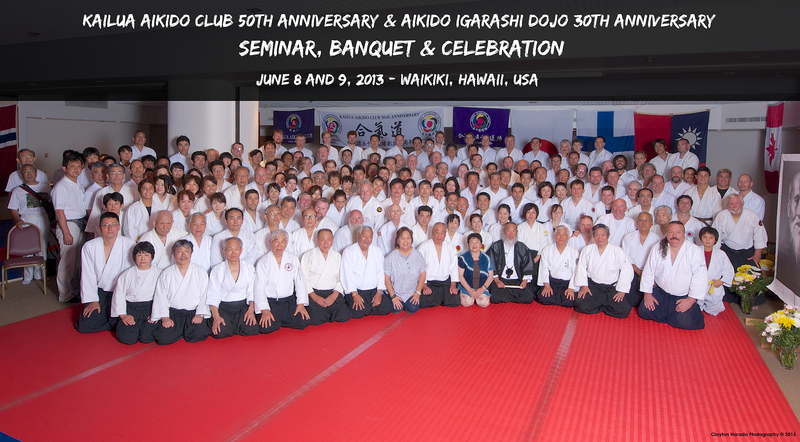 It has been two months since our 50th and 30th Anniversary Seminar in Waikiki. Igarashi Sensei and I are pleased that our goals have been accomplished. 1. We successfully organized a seminar outside of Japan and in a totally foreign setting. All the instructors were top of their class and they all shared their wealth of Aikido knowledge with the attendees. 2. The seminar helped strengthen the “Silver Bridge” that O’Sensei built to spread the art and philosophy of Aikido throughout the world. 3. We exposed our students to the teaching, techniques and philosophy of the visiting instructors. This seminar was an opportunity for the Aikido members to have had the “once-in-a-life-time” chance to first-handedly experience the teachings of these great and renowned instructors. 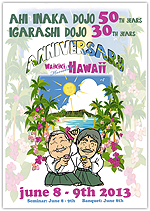 This experience was not just a celebration of my 50 years or Igarashi Sensei’s 30 years. It was a celebration of promulgating O’Sensei’s dream of spreading Aikido beyond Japan. To those who participated and helped to make this dream a reality, we cannot thank you enough. My brother, Igarashi Sensei, and I appreciate everyone’s support and participation. Our gratitude goes to the instructors for sharing their knowledge and for their participation in our events. To Doshu for his moral support and his guidance, we are grateful. We hope this seminar was a just a beginning of future seminars of this magnitude. Thank you from Igarashi Sensei, Inaba Sensei, and myself.